The current situation in the Arab world reminds me strongly of the end of the Soviet Union and its Warsaw Pact allies in the early 1990's. Though the Arabs do not have a centrally-controlled power structure like that of the late USSR, they nevertheless possess many more similarities, chief among them a reliance on a single core activity (oil vs. military), authoritarian/dictatorial regimes and enormous social inequalities. 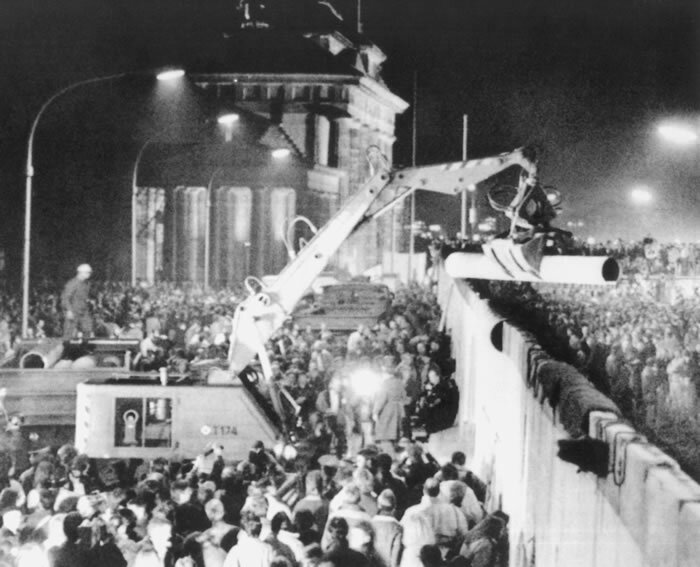 It looks as if the Arab "Berlin Wall" is crumbling right in front of our very own eyes. What it means for our hydrocarbon energy regime is impossible to predict. It could be that radicals take over and attempt to hold the world hostage to much pricier oil. Or, it could be that they pump all-out to satisfy popular demands for social goods and services, driving prices much lower. No one really knows. What is crystal clear, however, is that we urgently need to create to our own renewable, locally produced, stable energy sources and finally become independent of the Arab "street", as well as the Arab "sheiks". Pumping 'all-out' may not be an option Hell. Presumably the local oil engineers would caution restraint so as to preserve the integrity of the resevoirs. The real predicament is with the increasing populations of the oil producing states needing more of their own output for domestic consumption, the Export-land Model: Nett exports decline! Guess who loses! Perhaps the current carry-on in Libya has alerted the others that some pro-active prevention is preferable to after-the-event violence-control measures. Who knows? Anyway, I reckon that availability of fresh water is a more pressing problem for mid-east and Mediterranean states. The funny thing is that the Middle East oil states are some of the best ones for use of solar energy (unless extreme heat has an effect on solar panels that I am unaware of). However, I agree with Brian Woods that water and food are more pressing concerns for the person on the street (but, of course, it is tied to the price of oil because of industrial farming, as not much food grows in the desert). Yes, we do need to create our own renewable/alt energy, but it needs to pass the the EROEI test. En Masse, the renewable energy schemes in the U.S. fail that test. Pumping all out will simply steepen the depletion rate in Saudi where reserves, as per the work of Matt Simmons and others, are almost certainly vastly overstated. In the meantime the SA despotism is seeking to quell the populace through mass bribery. Should that fail, I expect a chain of events that will then lead to massive international military conflict in the region. The pie is shrinking and a lot of powerful players are going to go for the last slice. "there is no Euro Crisis in FACT"
Can you address this assertion in the context of Ireland?